RBTH presents a selection of views from leading Russian media on international events, featuring reports on a meeting in the Kremlin between Russian President Vladimir Putin and his French counterpart Francois Hollande, heavy checks and delays being imposed on Turkish imports, and the risk to the security of Crimea’s museums caused by the ongoing power blackout on the peninsula. Russian President Vladimir Putin met French President Francois Hollande in the Kremlin on Nov. 26. The French leader is continuing his "diplomatic marathon" after a series of terrorist attacks in Paris, the news website Vzglyad reports. Hollande has already held talks with the leaders of the UK, Germany and the United States. After speaking with Obama, the French leader said that his country would work with Russia in Syria if Moscow focuses on destroying Islamic State (ISIS). "This is what we want to do... To bring together all countries, everyone who wants to find a political solution for Syria. We do not want to exclude anyone," said Hollande. Russian experts believe that agreements may be reached on a joint operation against the Islamists. "France has already started to actively confront ISIS in Syria and, apparently, will increase its efforts, understanding that terrorist strikes may also be directed against it in the future," said former first deputy foreign minister Fyodor Shelov-Kovedyayev. Shelov-Kovedyayev recalled that Putin had proposed to create an international coalition to fight terrorism as early as the beginning of fall. According to the chief editor of the Russia in Global Affairs magazine, Fyodor Lukyanov, the French president will try to smooth over the incident involving the Russian Su-24 shot down by the Turkish air force on Nov. 24. "Judging by the reaction coming from NATO circles, Turkey's actions have caused shock and are perceived as inappropriate. 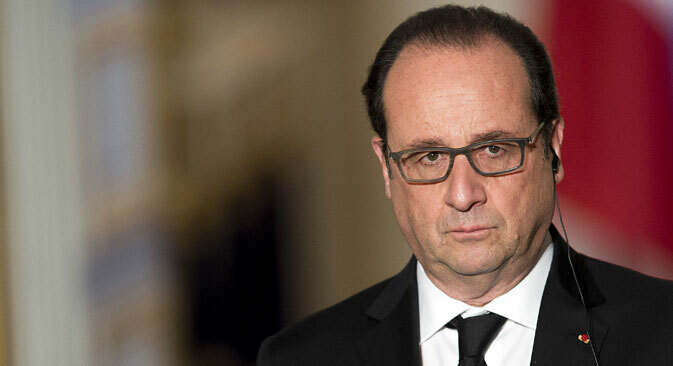 In this sense, I think, Hollande will try to smooth over the situation," he said. Against the backdrop of worsening political relations between Russia and Turkey, Russian customs are subjecting Turkish goods to irregularities and serious delays. All goods are being sent for a full inspection, the news website Gazeta.ru reports. "Good afternoon. The Belgorod customs announced today that they would not clear products made in Turkey. Without explanation. Does anyone know anything about this?" asked one of the participants of a professional forum. "Information from the Sheremetyevo customs. In the morning there was an instruction from the FTS [Federal Customs Service – RBTH] – to send Turkish goods for a 100-percent inspection, the unofficial orders are not to release them," confirmed another forum user. Previously, delays in clearing imports, especially fresh fruits and vegetables, were usually between several hours and several days. A source familiar with the situation told Gazeta.ru that there had indeed been a "secret order" to tighten controls during customs clearance procedures. "There is an order to shut down the 'green corridor' with Turkey, but it is secret," said the source. "There is no official document. But all the deliveries, where the country of origin is indicated as Turkey, are now being inspected thoroughly. In this case, measures including even re-export may be applied." Crimea’s museums have been badly hit by the blackout on the peninsula, and cannot maintain the required temperature; alarm systems are also not working in buildings, the daily broadsheet Izvestiya reports. On Nov. 20, unknown people blew up two transmission towers in the Kherson region that supplied electricity to the Crimean peninsula. On Nov. 22, the damaged towers were blown up once again. A total of 1.9 million Crimeans were left without electricity and water. The exhibits under threat include paintings by Aivazovsky (the artist's gallery in Feodosia hosts 417 paintings, including The Sevastopol Raid, Among the Waves and St. George Monastery), Polenov, Shishkin, Levitan, Korovin, Benoit, Serov, Roerich, Kuindzhi and others. Crimea's museums also hold hundreds of thousands of unique archaeological artifacts, including those made of precious metals. Larisa Sedikova, director of the Tavrichesky Khersonese Reserve, said that the museum had introduced a number of restrictions on visitors, since the alarm system was completely disabled. "We let the visitors into the rooms of the museum only during daylight hours; only the entrance to the territory of the settlement is open around the clock," said Sedikova. "Ukraine likes to say that it worries about the safety of cultural heritage of Crimea, which it considers its property. But in this situation, citizens of Ukraine have created a threat to the preservation of valuables."